The Jellinge style is named after the animal ornament on a small cup found in the royal burial mound at Jellinge, Denmark. This mound is thought to be the burial of King Gorm, in which case it would date to AD 958/9. The Jellinge style does not use the “gripping beast” motif. 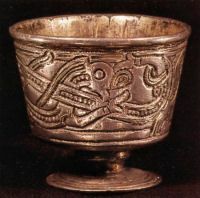 Instead, the Jellinge cup is decorated with S-shaped animals with their heads in profile and with ribbon-shaped bodies, spiral hips, “pigtails” and curling upper lips – all of which are distinctive features of this style. The Borre style and the Jellinge style overlap for much of their lives and, not surprisingly, there were occasional fusions of the two styles. The hoard in Vårby produced a silver-gilt pendant with a beast in the Jellinge style with its head in profile, a ribbon-shaped body and a pigtail, but also having the gripping paws of the Borre style.